Google Spreadsheets added an option in the sharing dialog that allows anyone to view or edit the spreadsheet just by knowing the URL. Until now, you had to send an invitation URL that contained a secret code and the people you invited had to login using a Google account. 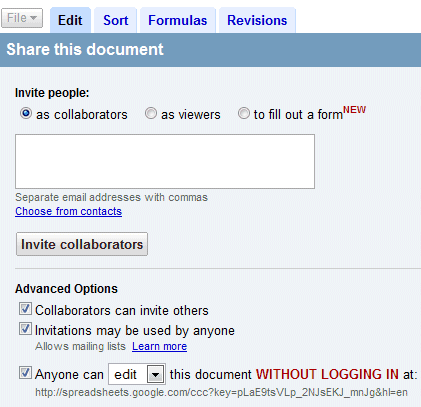 If you click on the Share tab and enable "Anyone can edit this document WITHOUT LOGGING IN", your spreadsheet becomes a wiki that can be edited by anyone. To experiment the new feature, I set up a spreadsheet that compares the features of two desktop office suites (MS Office, OpenOffice) and two online office suites (Google Docs, Zoho). The spreadsheet has three sheets for: word processing, spreadsheets and presentations. In other spreadsheet-related news, you can now embed forms in a web site by just copying some code, there's a new option to duplicate questions and users can add their own answer to a multiple-choice question. Update: You can view a snapshot of the spreadsheet after the first day of editing. The comparison has been extended with information about voice recorders, clay tablets, smoke signals, telepathy, Jedi mind control and more. Update 2 (May 26): You can no longer edit the spreadsheet. I don't think I have ever been so acutely aware of how many people, like me, stalk your blog nearly daily. Frankly, I'm a little appalled, frightened,and all in all super excited about that fact. Dude, you have just started CHAOS! It's the END OF THE WORLD IN THERE! I do NOT hate Word, Excel or Microsoft. But for a few months I've been using Google Docs for my (small) business and personal use. What I like best is having my docs available whether I'm on one of two Ubuntu Linux boxes, using my Thinkpad T42 running WinXP, in my wife's XP or on her (sweet!) large screen HP laptop with Vista. I own Office 2003, but have little reason to use it anymore. I am sure Zoho or several other sites are as good as or maybe better than Google. Sorry oho, I know Google is rich and will survive. I have no idea if you can get bought or make a living as a niche player. "If you're an Apps user, marking the Anyone can edit option will allow only people in your specific domain to edit the spreadsheet." If I was a spammer, I would LOVE this feature. Go take a look at the number of people editing that document, all Google Usernames!!!!! Toss @Gmail.com on there and you just got yourself started on a spam list! Was having a nice chat with someone there. Wonder if you can make a chat program out of this. With regard to the comment about spammers harvesting email addresses this way by adding @gmail.com on the end, that was an interesting observation so I looked into it a little. You can protect yourself from that by not using a gmail account to make an edit. If you create a Google Docs account using an email address on a different domain, the domain does not seem to show. If you edit the spreadsheet without being logged in, you'll be completely anonymous. anyone can edit? sounds like a bit of chaos here. is there a way that user can set a temporary password for edit ? for example, i send out this URL for everyone to edit and i send the temporary password on a separate email for those who want to edit. everyone can view but only a limited number of people can edit. (field trip at school: teachers and parents can view/modify, everybody can view). I think you really need to improve the way forms link to table columns. Instead of the current system, where users add fields to forms and then they end up at some columns, why not list columns sequentially by reference, use the first row as a suggested field name, and let people select for each such existing column what kind of field should be displayed in the form (or none at all)? I can see both positive and negative here. However, nice feature though. I love Google spreadsheets, I use it everyday! I can see where this is going to be very useful. In our church we often mail out a sign-up sheet for people to provide meals to families where someone is recovering from surgery or grieving a loss. In the past we put the signup sheet in an email, encouraged everyone to add their own name by a date and then hit "reply all" Everyone was encouraged to always reply to only the most recent copy of the email. It never worked that well. People would sign up on earlier generations, then click reply all, before you know it you have three or four completely different lists running around out there. With this feature of Google spreadsheets, just include a link in the email, and everyone's editing the same list. No need for all the replies and duplicate emails. I can't figure out how to get this to work, maybe it's not available if you're on google docs for a domain? In Google's "Documents and Spreadsheets", is there is any possibility to have margins in a document. In a regular word-processor there is a possibility to work with margins. I cannot find any such utility in Google's Documents and Spreadsheets. This means that I have to use the return (the enter key) to shift lines which leads to considerable editing anytime I wish to just change the contents of the text. Also, since each line becomes a new paragraph, there is no possibility in applying formats to the text. Does anyone know if this is going to be upgraded soon? I think it is a great idea to have web-based documents, there are some things missing for it to be truly useful.